Editor’s note: Recent research has uncovered a potential new way to fight some cancer types. The key is a protein called Eph3A, which is made by the cells of blood cancers and solid tumors. Researchers made a new drug called KB004 to target and kill cells with Eph3A. The drug is currently being tested in a clinical trial with volunteer leukemia patients. “An international team of scientists has shown that an antibody against the protein EphA3, found in the micro-environment of solid cancers, has anti-tumour effects. “Researchers have identified Down syndrome as a major risk factor for infection-related mortality among pediatric patients with acute lymphoblastic leukemia (ALL) enrolled in the Medical Research Council UKALL 2003 trial. “Long-term outcomes of patients treated for pediatric acute lymphoblastic leukemia (ALL) with modern treatment protocols are good, with an overall low risk for serious long-term side effects, according to the results of report from the Childhood Cancer Survivor Study cohort. “ ‘This data will be useful for oncologists counseling newly diagnosed patients, and provides reassurance that the ‘devastating’ diagnosis of ALL can often have good short- and long-term outcomes,’ study author Paul C. Nathan, MD, of the Hospital for Sick Children, University of Toronto, told Cancer Network. “The FDA today granted breakthrough therapy designation for CTL019, an investigational personalized immunotherapy, for the treatment of relapsed and refractory adult and pediatric acute lymphoblastic leukemia, according to a press release issued by Penn Medicine. “CTL019 (Novartis), developed by the University of Pennsylvania, is the first personalized cellular therapy for the treatment of cancer to receive this classification. “In early-stage clinical trials conducted at the Hospital of the University of Pennsylvania and Children’s Hospital of Philadelphia, 89% of patients with ALL who were not responding to conventional therapies achieved complete remission after treatment with CTL019. Editor’s note: This story describes a new leukemia treatment called CTL019, which boosts a patient’s own immune system to fight cancer. 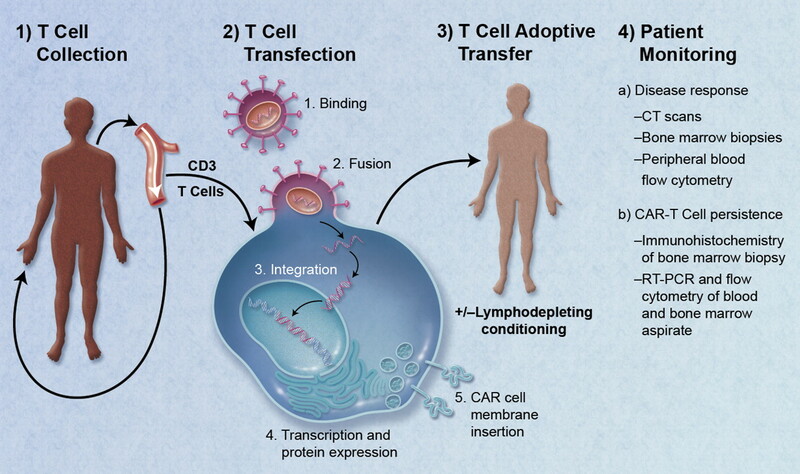 CTL019 treatment is personalized for each patient, since it involves altering a patient’s immune system cells to attack tumor cells. It has been tested in volunteer patients in clinical trials, and has shown promising results for adults and children with relapsed or refractory acute lymphoblastic leukemia (ALL). The U.S. Food and Drug Administration (FDA) has now granted breakthrough therapy designation for CTL019, meaning that review and approval will be accelerated so that the drug can more quickly reach patients outside of clinical trials.